Yesterday the pupils from Werrington and North Petherwin Primary Schools joined together with parents and members of the community, for the annual carol concert at North Petherwin church. Each class from each school took turns to sing a Christmas song or carol and some children gave a Christmas reading, prayer or a poem. 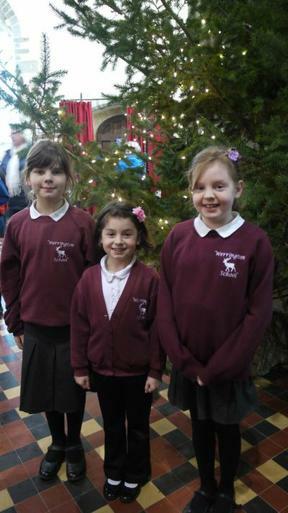 The following songs were sang by the pupils of Werrington School: Class 1 sang 'Little Donkey', Class 2 sang 'The Calypso Song' and the Werrington Choir sang 'Silent Night'. The children from Class 1 at North Petherwin sang 'Five Woolly Sheep', Class 2 from North Petherwin sang 'Away In a Manger' and Class 3 sang 'We Three Kings'. Thank you to Rev Pengelly, all those who attended and to the members of North Petherwin Church, who kindly provided refreshments for all.